The 20th of December marked my last day of final exams! I am free!! And survived my first university finals/term one! And then we walked around downtown. We wanted to watch Sherlock Holmes 2 so we continued shopping around until 4-ish. However, Carmen suddenly came up with a great idea: to hunt down a takoyaki food cart! Apparently the cart can be found at Howe and West Pender and we rushed there. At first we were slightly disappointed because it seemed like there was no cart…but then when we turned the corner, there it was! 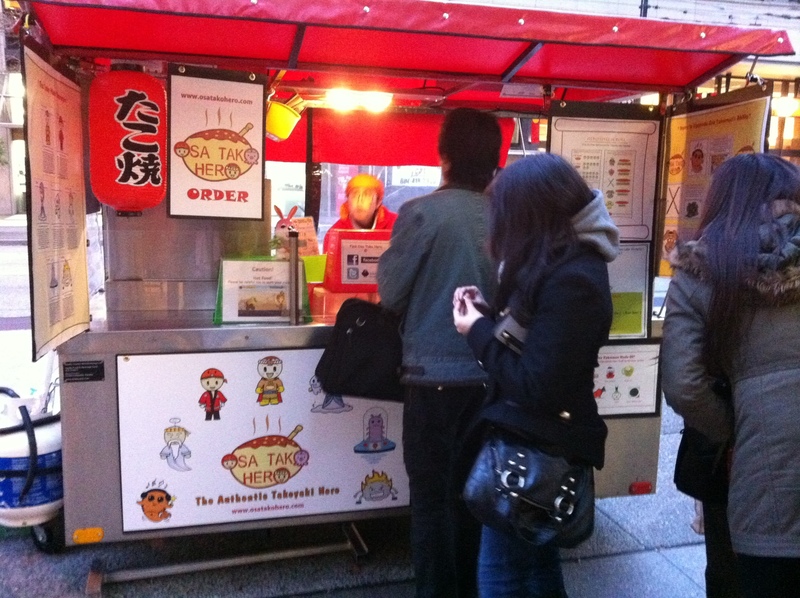 This takoyaki food cart is the cutest thing ever! 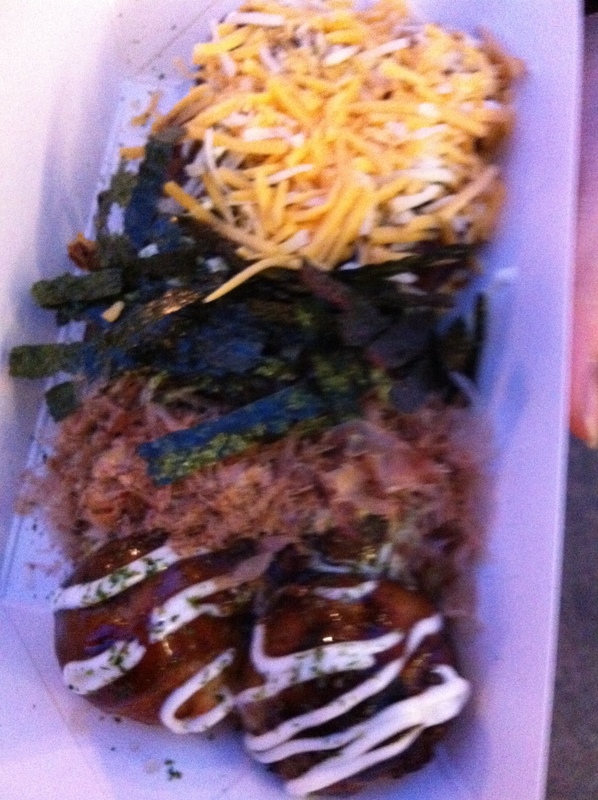 It was called Osa Tako Hero Takoyaki! The menu featured their food in a game-like theme. First you chose your ‘heroes’ a.k.a how many takoyaki you want. Then you can choose power-ups to upgrade your heroes’ abilities, a.k.a what sauce/toppings you want on your takoyaki! I was really hesitant to try the maple syrup one, but Carmen wanted to. In the end, the guy making the takoyakis allowed us to have a bit of each topping! 🙂 Surprisingly, the maple ones did not taste sweet! Hero scroll! Choose how many heroes you want :3 And then their abilities on the side! Our ten heroes with mixed abilities! Ahaha sorry for the blur! Waiting for the takoyakis took pretty long and since our movie starts at 4:45, it seemed like we were going to be late. 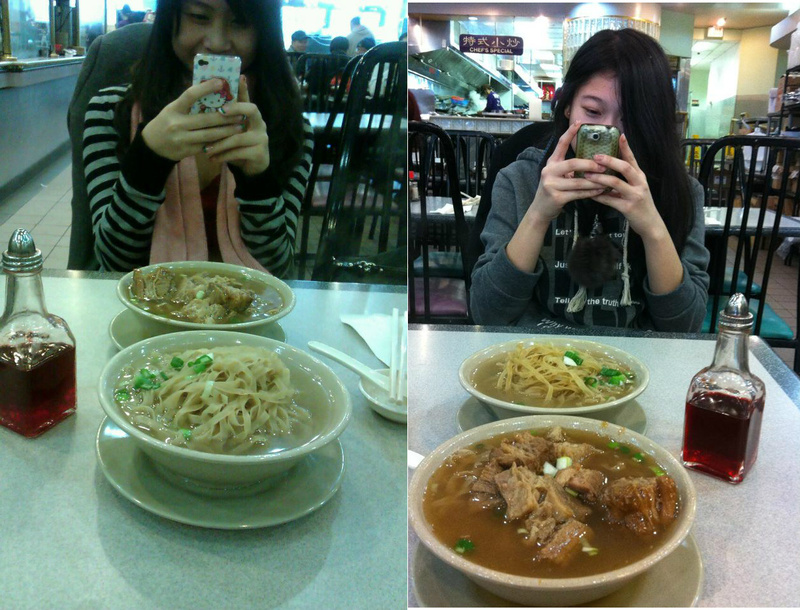 We had to walk bad to Scotiabank theatre and then buy our tickets! We were running towards Scotiabank, but then we saw a bus, so we jumped on. We go to the theatre with minutes to spare and bought our tickets. That’s when Carmen and I realized that it was Tuesday and the tickets were half price!!!! AHHH lucky us! ^.^ And we basically got into our seats just in time as well! Sherlock Holmes 2 was very good in my opinion. Filled with wit and humour, Robert Downey Jr. and Jude Law’s amazing screen chemistry will never cease to amaze me. Oh, and why must I fall in love with Robert every. single. time. I. see. him. in. a. movie? So, thank you Carmen for the perfect after-exams day! And LOL to us falling asleep at random times of the day because we were both lacking sleep! I missed you Carmacorn and I am so glad we got to catch up! 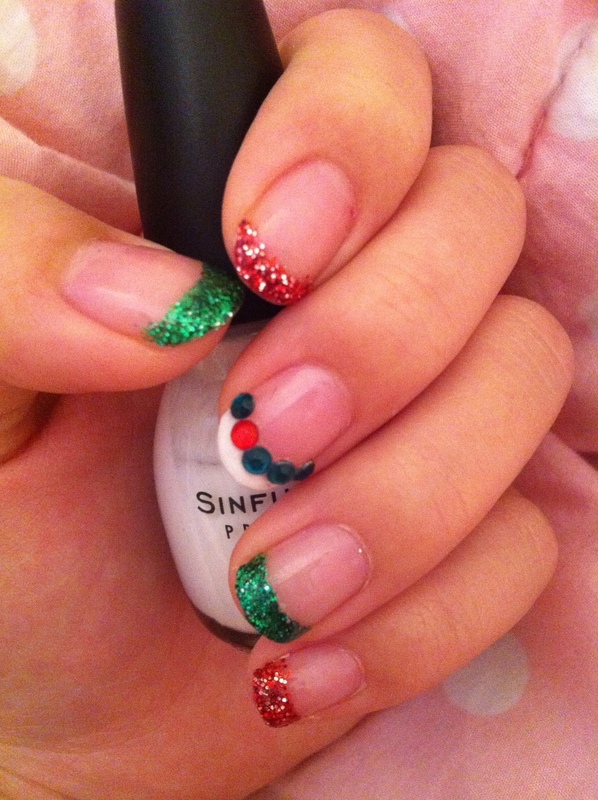 Oh and here are my nails for Christmas! So close I can almost taste it! Gimmie the Gingerbread! Love your nails, so fun! Honestly, although i watched the first one, i don’t remember it being quite as good as this one. This one really left a lasting impression on me!